M-Tech Plastics based in Gauteng (Johannesburg), South Africa is on track towards achieving its long-term service and supply goals, with news of investments in top-class converting equipment to meet a stringent service strategy and to enhance its fast-growing flexible packaging operations. “We’ve embarked on equipment purchases in line with our expansion plans,” explained Barry Le Roux, Managing Director of M-Tech Plastics. “This includes a recently installed Titan ER610 compact slitter rewinder, supplied in collaboration with Beswick Machinery, the local agent for Atlas Converting Equipment Ltd. in the UK. 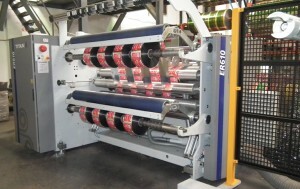 We also plan to place orders for a Nordmeccanica Super-Combi coater/laminator and a Rotomec ELS ten-colour gravure press, both scheduled for delivery in 2013.” “We’re experiencing substantial organic growth and service levels remain of utmost importance to our management and operations teams. We’re constantly striving to improve our performance to support our customers’ valued brands and believe the latest investments will open the arena for us to produce and deliver exceptional products,” he further commented. Until now, slitting and rewinding at M-Tech Plastics has been completed on two machines. “Our existing equipment carried us through our early growth stages, but it’s now time to push ourselves into the next level. We’ve always appreciated Titan’s world-class technology and the new Titan ER610 has hit the perfect balance between price and performance. Also Beswick Machinery has an excellent team providing top-class technical and maintenance support, so I’m very happy,” Mr. Le Roux confirmed. The Titan ER610 is an affordable, high-performance slitter rewinder designed to run at a production speed of 450m/min and can handle a minimum 35mm slit width, with a rewind diameter of 610mm. The 1650mm web width machine installed at M-Tech Plastics also features an integral edge-trim extraction system and an integral shaftless unwind for a maximum 1000mm diameter roll. The pneumatically-controlled braking system provides accurate web tension control and a digital edge guide system controls lateral movement of the unwind reel. Also included is a high-speed HMI control system with a 10” touchscreen terminal, non-language symbols, compact flash memory and fault diagnostics. ‘The control system simplifies operation. Anyone who can use a cell phone can operate the machine,’ commented Riaan Hopley of Beswick Machinery. “Installation and operator training was carried out by our qualified technicians and the ER610 is already having a very positive impact on quality and service to M-Tech’s customers,” he added. Barry Le Roux’s ultimate goal is to reduce lead times drastically and produce consistent, high-quality goods for all customers. “We’re upgrading our systems to enhance our manufacturing capacity and the Titan is already handling the majority of our slitting requirements. From next year, we’ll experience a serious rise in production and then we’ll see this impressive machinery perform to its true potential. We have every confidence that the Titan’s performance will speak for itself and we’ll be purchasing more Titan slitting equipment in the future,’ he concluded. M-Tech Plastics was established in 1990 and has evolved in to one of South Africa’s leading converters of flexible plastic packaging materials. The company produces high quality gravure printed BOPP, PET, PVC, PE and paper, as well as duplex and triplex laminations. These include 5 layer co-extruded Nylon, EVOH, Nucrel & Surlyn barrier films which are all produced in line with ISO22000/HACCP quality and food safety management systems. The ER610 is available in two standard widths – 1350 & 1650mm – with slitting systems available as shear knives, rotary razor (burst) or razor slitting in air or groove. Optional features include laser (line) core positioning, laser safety scanners and also a shaftless unwind roll pick-up from the floor. It is a more environmentally friendly solution with reduced power consumption, no hydraulics for oil-free, hygienic operation, un-lubricated compressed air for zero oil/air emissions and less steel through its compact design. Its ‘one-piece’ construction also enables rapid installation, commissioning and simplified logistics.